Which tours are available from Florence? We are leaving florence on an early morning flight - is that going to be a problem? No, not at all - we are used to that - it only requires to take care of it the night before - that includes ordering a wake-up call, an early taxi and an early breakfast (served by the night porter). What is the city sightseeing bus? The City Sigthseeing Bus is a special bus line covered by a comprehensive ticket which lasts 24 hours and allows unlimited stops (hop on and off) to visit Florence attractions. It is a very good option for a general overview of Florence in just a few hours. Headphones and commentary are included, too - ask at the reception for tickets and details. Is it a good idea to visit florence by local bus? Florence attractions are really very concentrated in the old historical part of the town, just a few steps away from Hotel Casci - in other words, most of the city can be covered on foot. Usually tourist use the buses only to enjoy the lovely view from Piazzale Michelangelo (south of the city centre by bus no. 12 or 13) or to visit the neighbouring village of Fiesole (north of the city centre by bus no. 7). A very good option for a general overview of Florence is also the City Sightseeing Bus lines, which cover the whole town - the ticket allows unlimited hop-on and hop-offs and is valid for 24 hours. Headphones and commentary are included, too - ask at the reception for tickets and details. Most events in Florence can be booked on line through www.boxol.it. However, many performances can also be booked on www.maggiofiorentino.com. Are travellers' checks widely accepted in italy? Until a few years ago, travellers' checks used to be one the main payment methods for tourists, both for hotel stays and for shopping. However, with the advent of the Euro, banks have lost a lot of income which used to derive from the exchange business and nowadays they tend to replace that with higher commissions on t/c's. THAT APPLIES TO TRAVELLERS' CHECKS IN EURO, TOO !! Therefore, it is not rare to find places where they are not very willing to accept t/c's. Our suggestion is to have some, just in case, but to be prepared to also have also cash, too. Is it a good idea to have a car whilst in florence? One of the nicest aspects of the visit to Florence is that ALL highlights (i.e. churches, monuments, museums, shops, etc.) are concentrated in Florence downtown and literally a few steps away from Hotel Casci. Therefore, a car for Florence ONLY is really more of a pain (and a cost) than a help. If instead you are touring all around Italy, then having a car will allow you to enjoy some lovely country-side driving and visit some other towns such as Siena, San Gimignano, Pisa, Lucca, etc. at your leisure. Is there any car rental outlet close to the hotel? 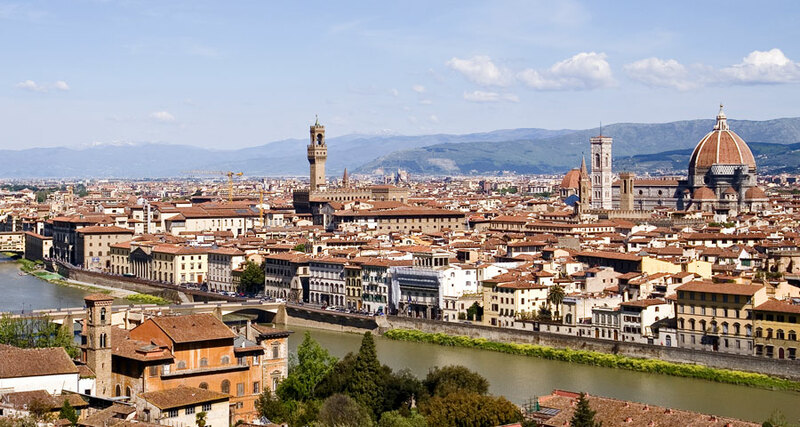 In Florence downtown ALL car rentals are located close to the main railway station (either on BorgoOgnissanti or on Via Maso Finiguerra or on Il Prato), which is about half a mile away from Hotel Casci. The drive is not very diffucult and we shall be happy to draw it on a map for you. If your rental starts in Florence, you may either take a taxi with the luggage to the rental outlet OR the brave driver could walk there and drive back to the hotel in order to get the rest of the party and the luggage - again, we shall be more than happy to draw the way on a map for you!! By the way, DON'T FORGET to always notify the hotel receptionist anytime you enter the city center by car - that is most important !! Which schedule should we follow in florence over the week-end and on monday? the three main museums (i.e. Uffizi, Accademia and Pitti) are closed on Mondays and therefore they can be visited either on Sundays or on Tuesday morning. Of course, if you remain in Florence for a longer period, Monday is the best day for a trip to either Siena/San Gimignano or Pisa/Lucca, Chianti, Cinque Terre or even to Venice or Rome for the day. Does the hotel make reservations for any tours and visits in and around florence? Yes, of course, upon your arrival we shall be pleased to assist you in making reservations for tours and walks around Florence and/or tours to Siena/San Gimignano, Chianti vineyards, Pisa, etc. We are also able to arrange private chaffeur driven minibus tours in case you are a small party or you have some special requirements. Is it possible and easy to visit the shopping outlets around florence (the mall, gucci, prada, etc.)? The Mall, Fendi and Dolce & Gabbana are located close to each other by the village of Rignano sull'Arno, whilst Prada is another 15kms away, just south of Montevarchi. There are various ways of visiting them. Either by organized tours, Monday (full day), Tuesday and Friday (afternoon), Saturday (morning); the cost is Euros 20,- for half day or Euros 27,- for the full day trip. By car, either on a chaffeur driven organized tour or with a rental car by motorway to Incisa Valdarno (for The Mall, etc.) or Valdarno (for Prada). Are all museums closed on sundays and mondays? On Mondays, the three main museums (i.e. Uffizi, Accademia and Pitti), are closed all day, but most of the other museums are open. Is it really necessary to make museum reservations? From March to October and during the winter holidays we strongly suggest to make reservations for the Uffizi Gallery and the Accademia (David), as queues could be very long. However, if you are early risers, both museums can be visited without reservations by showing up at the opening time at 815am. Other museums (Pitti, Bargello, Medici Chapels) do not really require reservations, not because they are not worth a visit, but just because they are not usually included in the main organized tours. We shall be happy to assist you in making museum reservations.